Planting Depth: 1" - 1.1/2"
Bed prep: Prepare beds by adding compost at 1/3 volume and SROF at ¼ cup per square foot. Mix well by spading. Install vertical supports of choice. Planting: Plant 1" - 1.1/2" deep, 3" apart. Bean seed germinates reliably, so it is not necessary to overseed. Cover seed, tamp, and water well. Bean seed often benefits from pre-soaking before planting, place the seed in a glass or jar and cover with water. Do not soak for more than 4 hours. We use bean inoculant - not everyone in this area agrees with this practice, but we think it increases the harvest. Watering: Twice a week without sufficient rainfall. Aftercare: Keep bed free of weeds – mulch. Watch for pests. Harvest: Use two hands to harvest to prevent breaking the vines. Hold the cluster of beans in one hand, hold the vine stem in the other, and pull gently. You can also snip fully developed pods from the vines with scissors or snips. One can become skilled at holding the pods in their hand, pinching the stem between the thumb and forefinger and stretching out the hand to pull the pods from the vines, but until this skill is acquired, either use two hands to harvest or snip the pods. Pole Snap Bean Pests: Leaf-footed bug - difficult to control with sprays; use a battery-operated vacuum cleaner or tap the vine with the leaf-footed bug over a small bucket of soapy water. The beetle will fall in the water and die. 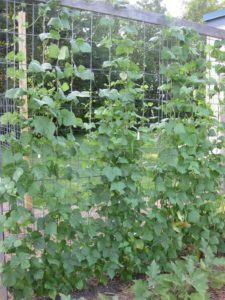 Additional Information: Pole beans can be grown in containers. After harvest, cut the bean stems off at the surface of the soil rather than pulling them. This will add nitrogen to the soil. History: The stringless snap bean was not developed until the late 1800's. Prior to that, green beans had a tough, fibrous string on the seam and a tough pod lining. String beans were cultivated for thousands of years, but they were not the tender, flavorful bean we know today.